Yes, some Sisters will be joining us! To view this video-please turn the volume off on our playlist at the bottom of the page first. 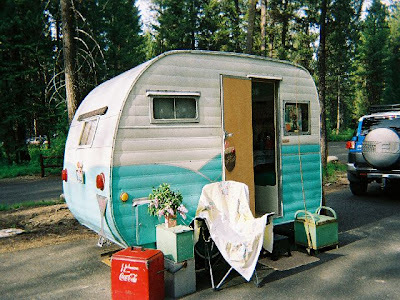 It's true, they are a comin...and if you come to our Funky Junk Sisters Show on May 14th and 15th you will get a chance to see these sweet little vintage beauties (the trailers that is...lol)! They will be set up for viewing on Saturday!!!! Here we are blogging from the road again. We are in Oregon hunting for treasures to sell at our next show. 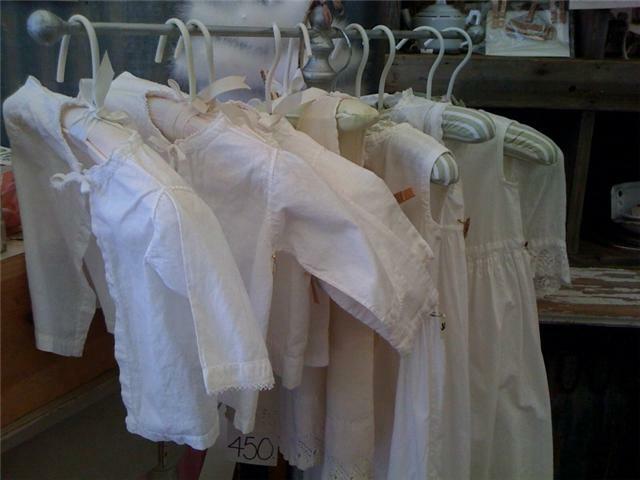 We have gathered so much good stuff we are bustin at the seams in the warehouse. "Where are we gonna put all of this" is what our special advisors (husbands) are screamin! We just replied calmly " Don't worry we have plenty of junk sisters coming to visit and they want the best selection of the coolest junk!" 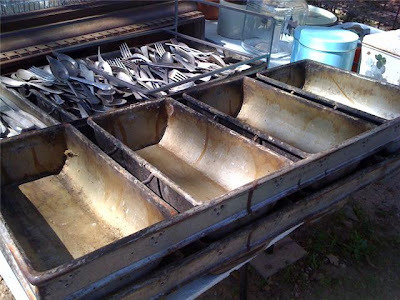 Cuz we don't want you to miss out on what to do with your new finds... we will be offering some free tickets on our facebook fan page to Sue Whitneys (Of Junkmarket Style fame) class on Saturday May 15th! Go to Funky Junk Sisters Vintage Flea Market fan page to enter to win! Our show is just a couple of weeks away so make sure you have made plans to attend! We can't wait to meet you! Here's a sneak peek into what you will see at The Funky Junk Sisters Vintage Flea Market in May. 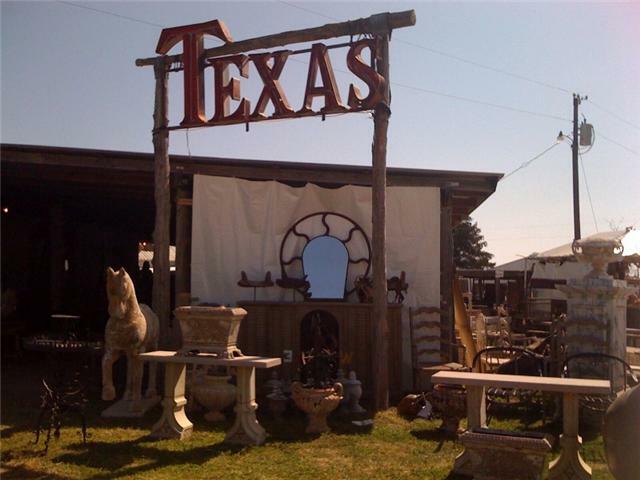 We have gathered from near and far to bring you the best junk. We brought back plenty of booty from Texas and lots from Eastern Washington and Idaho too. 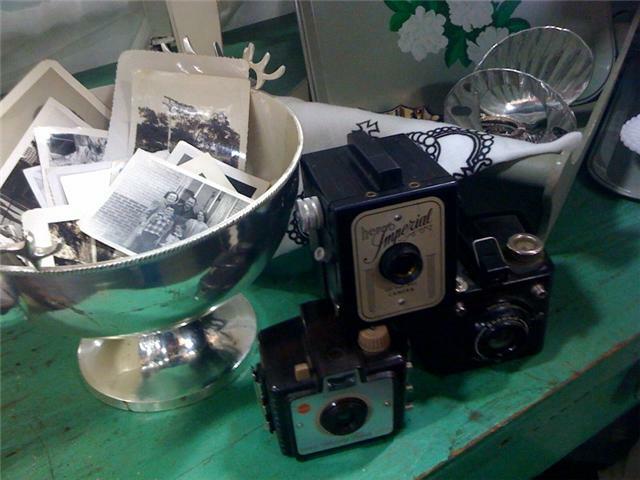 Here are a few pics from our booth at The Puyallup Fair last weekend... We just love the way these old photos look with the vintage cameras, don't you? 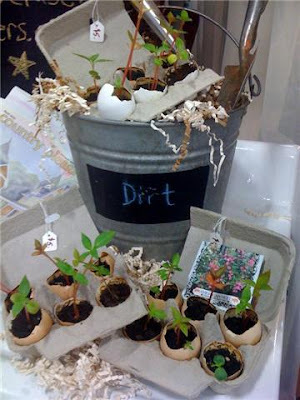 These little seedlings were the hit of the garden area. Shopping carts are a must have when you attend shows. This red one went fast! This is just the tip of the iceburg. 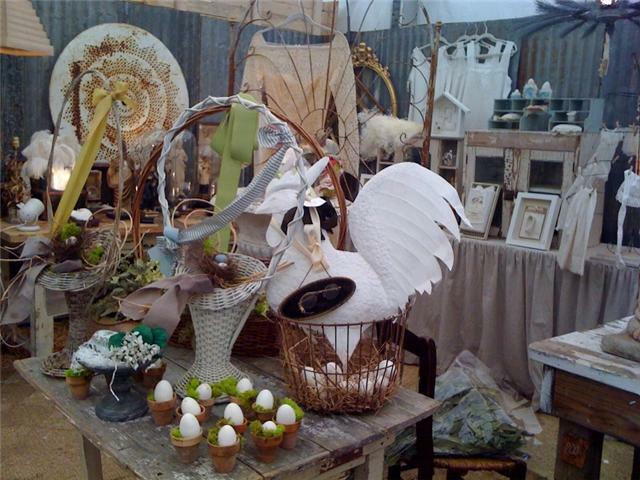 We have lots of fabulous vendors with just as much good stuff! 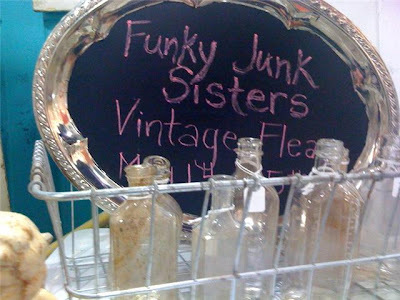 Make sure you are making plans to attend The Funky Junk Sisters Vintage Flea on May 14th and 15th. Call all your best junkin buddies to get there early cuz the best junk will go first! Better yet, come to our Meet & Greet with Sue Whitney of JunkMarket Style. She'll give you some pointers on how to look for the best junk and show you what to do with it. AND she'll get you into the showroom floor an hour earlier than everyone else!! Sue will personally walk you through the booths and she'll share her junk secrets along the way. You can buy your tickets here on our blog or stop in Today's Country Store in Sumner Wa to purchase them in person. If you go to Sumner, make sure you tell Kris and Amy we sent ya! The Creative Connection Event....little ol' us? Well gals if you don't know about this event, then you are missin out on somethin special! If you are the creative type and we know most of our readers are...then you'll wanna check this out. It's the THE CREATIVE CONNECTION! A 3-day conference, crafting extravaganza and emporium for creative women and women entrepreneurs. Created by Nancy Soriano, former editor in chief of Country Living and Jo Packham, the founder and editor in chief of WHERE WOMEN CREATE , THE CREATIVE CONNECTION will bring together women who are passionate about being creative in their lives as artists, business owners, bloggers, and more. Come learn, network, market, and create! Guess what? These amazing ladies asked if they could do a blog story on us. Can you believe it? Geezzz, we never thought we would be worthy of anything like this! 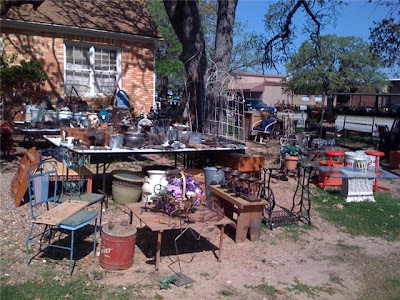 We just like cool junk and we like to tell people about it. Guess you could call it blabbin bout funky junk! Anyways, they call us entrepreneurs, maybe we are but it's just plain ol' fun to us! Seein who can load the truck up with the most junk is a game us Junk Sisters just can't live without. Junk Queen Sue Whitney - the original Junk Master will encourage homeowners at The Funky Junk Sisters Show to salvage flea market finds and unused “junk” to create treasured home furnishings. She knows the ins and outs of making pennies count. 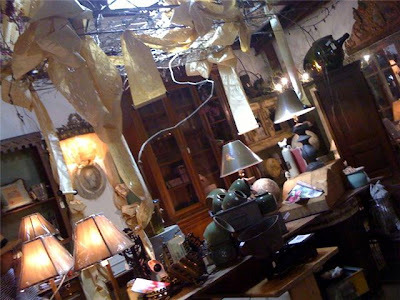 Her “junk” style sheds financial constraints associated with bringing new furniture into a home by fabricating unwanted items into re-purposed nostalgia. 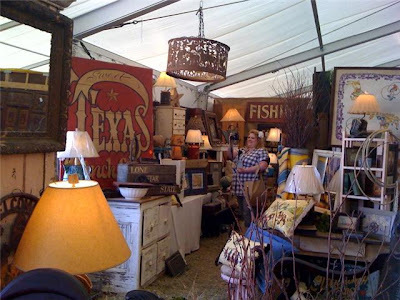 Sue,co-author of Junk Beautiful, was a contributing editor for "Country Home" magazine and has appeared on the “Today Show” and HGTV’s “Country Style,” where she transforms junk into fun, elegant and functional furniture and home décor. 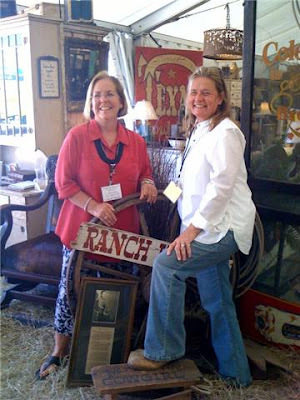 Here's the good news Junk Fans, you can attend a seminar with Sue Whitney and learn the secrets to good junkin at The Funky Junk Sisters Show. You may purchase a ticket to the Friday night event where you will attend a Meet & Greet with Sue at 4pm. Here she'll do a book signing and an exclusive seminar sharing with you many of her re purposed projects. Wait, that's not all...after the seminar Sue will lead you into early shopping of The Funky Junk Sisters Vintage Flea where she'll personally walk you thru the booths before all the other shoppers enter! Can you say, special privileges? But there is more...this ticket will also get you into our fabulous charity event "Operation Save A Rack"! Where you'll rub shoulders with all big wigs in the junk world (our world that is!). This is a party you won't want to miss! 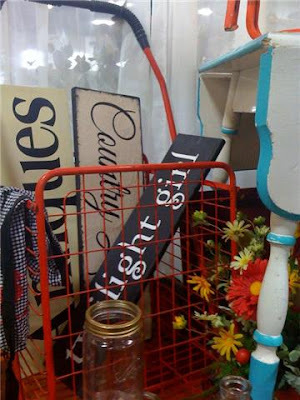 Tickets for Saturdays events with Sue will get you into her JunkMarket Style Class at 11am where she'll show you 3 different projects that turn junk into beautiful! At 2pm the famed Junk Queen will do a book signing, here she'll have her newest book "Junk Beautiful Outdoor Edition" available to purchase! OK, here's the deal, tickets are limited to both events so you better act fast! Gather up all your best junkin buddies and purchase tickets at the top of our blog. Do it soon, you won't want to miss this! 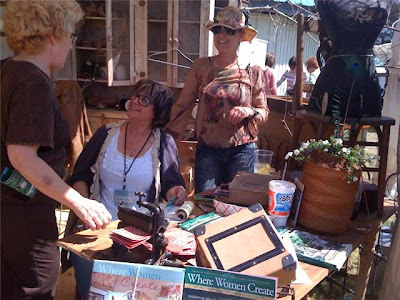 When sisters, entrepreneurs and fans of all things vintage, Dixie DeRocher and Linda Albers, open the doors of their Funky Junk Sisters Flea Market in Puyallup, Washington May 14 and 15, they’ve got a little something extra to share. “Oh, you are just going to love the news we have for you!! !” they teased from the Funky Junk Sisters Facebook page. 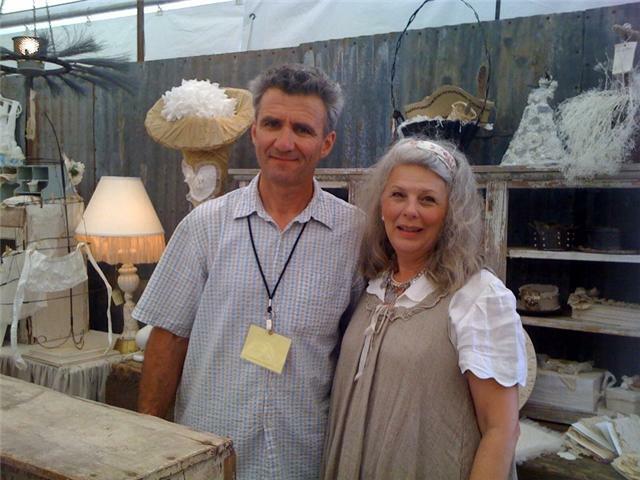 The big secret is that DeRocher and Albers have invited Sue Whitney, of JUNKMARKET Style fame, to join them. Whitney, who is well-known to viewers of HGTV’s Country Style, got her start in 2000 when she opened a workshop in Minnesota. There she created one-of-a-kind objects using vintage odds and ends she salvaged and brought home from flea markets and barn sales. In 2003 Whitney became editor-at-large of Country Home Magazine. Now, the author of four books has launched a magazine and makes frequent television appearances including the Today Show. When Whitney joins the Funky Junk Sisters in Puyallup in May, she’ll be available to shoppers who’ve purchased special tickets. On Friday, for $75, fans will get a one-hour seminar by Whitney, as well as a chance to spend another hour doing some shopping with her and have her sign books. On Saturday, a $30 ticket buys admission to a special one-hour seminar by Whitney and a book-signing. Details are still being ironed out but DeRocher told me in an email that they think Spokane “junk” fans will be thrilled. “This is going to be the best show to date!” De Rocher said. We'll have all the info about Sue's visit and ya'll will be able to purchase tickets to her special appearances on here soon. Be watchin for it! More information about the Funky Junk Sisters Flea Market. OK all you junk queens out there, we've got some great news. The Funky Junk Sisters are giddy with excitement! Ya'll know how much we love these cute little trailers....well now you'll get a chance to tour a few of the "Sisters On The Fly" vintage travel trailers at our Funky Junk Sisters Show in May! 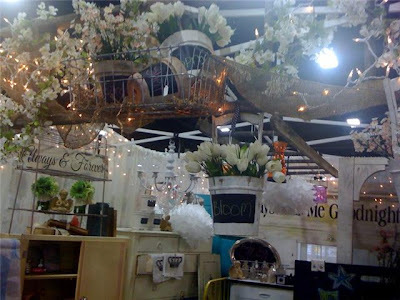 Kari Brewer Sister #724 will be a vendor at our show. This lil' darlin is Vintage Vetty, her 1958 Corvette. She's done up in old quilts, bark cloth, cowgirl stuff and she's very campy shabby. So come on, put your sh**kickers on and saddle up for a real fun time with The Sisters On The Fly and us! Don't forget May 14 & 15 in Puyallup, WA! We are at it again! This time we have teamed up with The Susan G. Komen 3-day for the Cure. 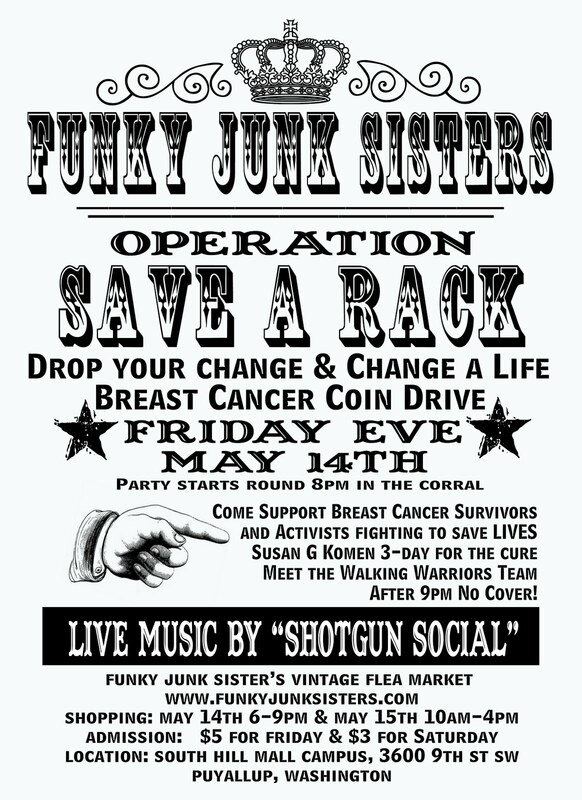 Some of our vendors for the Funky Junk Sister's Vintage Flea Market are Breast Cancer Survivors or activists FIGHTING to SAVE LIVES! There was such an overwhelming response from our last show that we just have to do it again. We are doing things a little different this time! 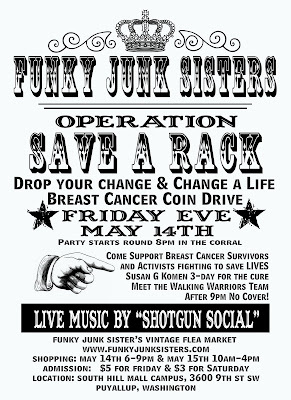 Claudia Lindsey of the Junkies~ Sisterhood of Traveling Junk (who will be at the Funky Junk Sister's Show) is an avid breast cancer supporter. She has helped us put together a great event. This is OPERATION SAVE A RACK! We are asking you to ~ Drop Your Change & Change A Life! There will be donation stations throughout the event area. Come shop for a Cure from 6-9pm for just $5. After the close of the Flea Market on friday night we are opening an area for LIVE MUSIC by "SHOTGUN SOCIAL" a local band that is up and coming! We will also have some goodies to get the party started. This EVENT is FREE to get in! If you are a breast cancer supporter then we want you!!! If you would like to make donations before the event... we will have that infomation posted on our blog shortly. Let's make this better then ever! Help us spread the word... invite your friends, family, and neighbors. We need to help this cause! Please, add the flyer to your blog, website, and facebook or you can just share this post! It doesn't matter if you live in Washington State or in New York this is something we all need to fight for. Join us for a fun night to help a great cause! We have some great vendors for you. Don't miss this EVENT! 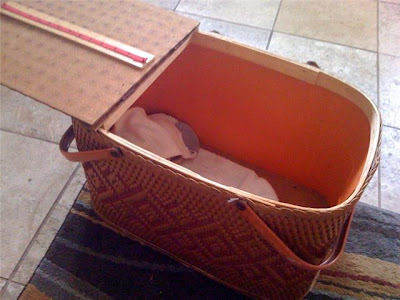 What's in that cute little vintage picnic basket? A sweet little surprise for Funky Junk Sister #1 (mom)! We can't wait to give it to her, but he doesn't have a name, any suggestions? 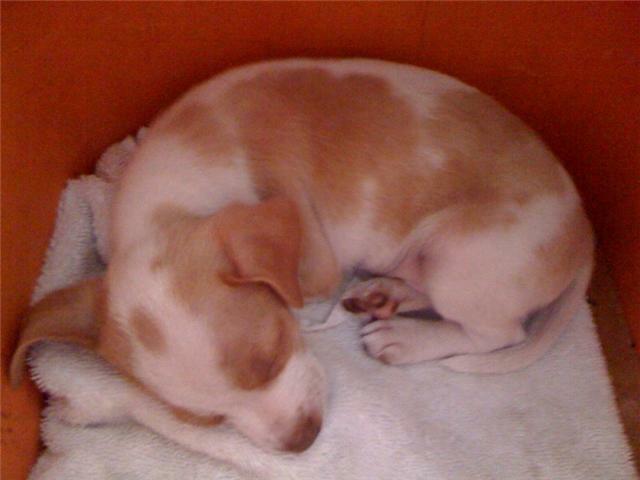 He'll only weigh 7 pounds when he's full grown. Just darlin, don't cha think? Videos from Texas Antique Week! We had such a good time in Texas, we fit so much in just a few days! We couldn't see it all...we'll have to go back! Here's are a few videos we took while we were there. Enjoy! Had a junkin good time with the Junk Gypsy gals. We had a radio interview with "Junk in My Trunk" at The Junk Gypsy tent on Thursday morning and while we were there they pulled in Miranda Lambert's Vintage Airstream freshly decorated by The JUnk GyPSieS themselves. The Junk Gypsy Prom was FANTASTIC! It was everything that everyone told us it would be and more....take a look for yourself! Thanks to Jolie and Amie for their Texas hospitality. You just gotta watch this last video....Jolie you rock! More inspirational pics from Round Top to come! 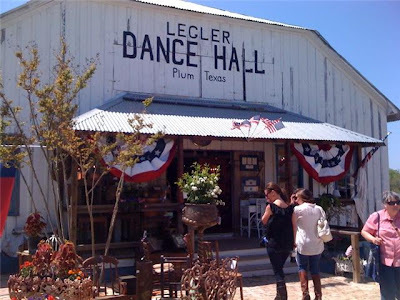 Ok, we couldn't even get all the way to Round Top before we stopped!!! We saw this garage sale in Giddings and couldn't resist... Our first find of the day, old bread pans and silver ware. We're traveling the back roads of Texas to find the best junk and we are bringin it back to you for our Funky Junk Sisters Show in May. Seriously, isn't this a great pic? 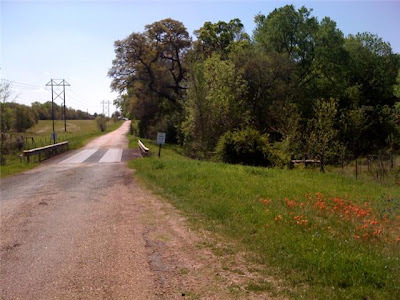 All of a sudden our GPS sent us down this wonderful road, so scenic and beautiful. We arrived at Marburger farms. Here is the Magnolia Pearl booth, we had to wait around awhile to get in, it was so packed. The girls here were awesome and were gracious about lettin us take photos for a magazine (more about that later). 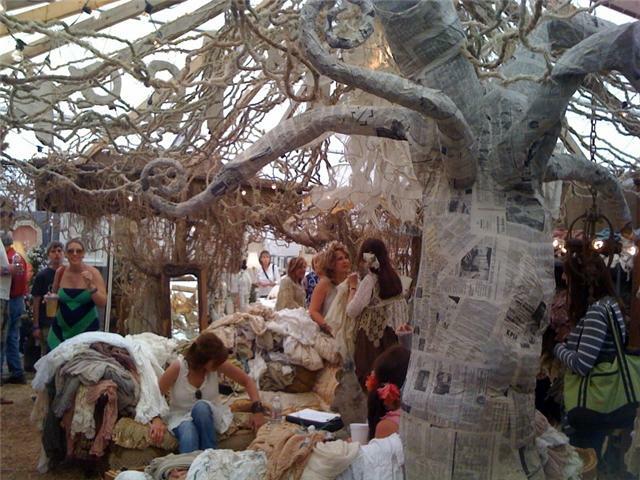 Here is the absolutely fantastic paper mache' tree they had in their booth! 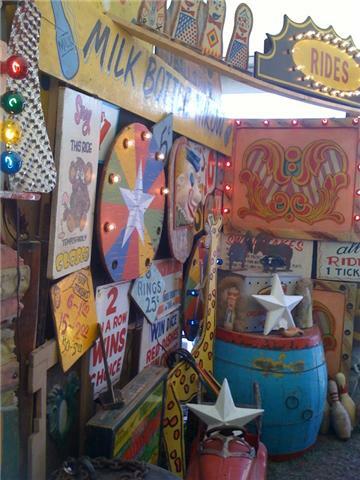 Loved the colors in this carnival booth. This is Willow Nest, you North Westerners may be familiar with them they were in Oregon before they moved to Texas. They have done Barn House Shows. Linda and Ludmil, the proprietors of Willow Nest. We visited with Jo Packham of Where Women Create. We chatted about her upcoming retreat in September. We'll be there! More fun photos from booths. Loved this display, it's a bed spring hangin from the ceiling. The ribbon is sheet music from an old player piano. Now that's funky! Here is building on the grounds of the Round Top Festival Institute. We are staying here in Tree House Room #3. 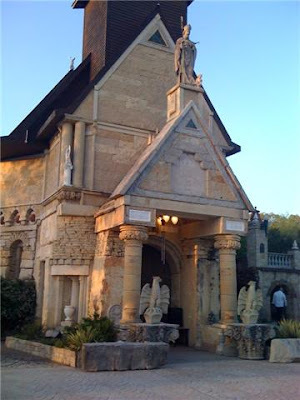 We attended "The Round Top Experience" book premiere in the courtyard of this chapel. 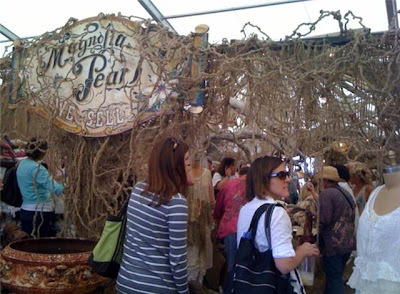 It was a lovely party thrown at twilight, full of many of the vendors featured in the book. 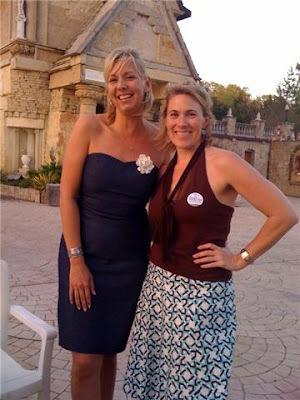 Here are the charming authors of the book, Gretchen von Rochow and Kerry Rupp. It was so fun visiting with them. They are both formerly from Seattle so we had lots to talk about, including their love of scones from the Puyallup Fair. We'll have to send them a bag of scones from the Spring Fair in April, we'll have a booth there so make sure ya'll stop by to say Hi. We're doing a radio interview today with the Junk Gypsies, so we gotta get goin! More later.